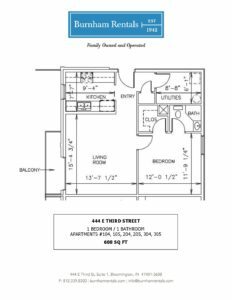 These 1-bedroom/1-bathroom apartments at our 444 E. Third Street location offer many amenities and are located just 1 block west of the southwest edge of the Indiana University Campus. There is a washer and dryer in each apartment. These are all electric apartments and Internet is included.